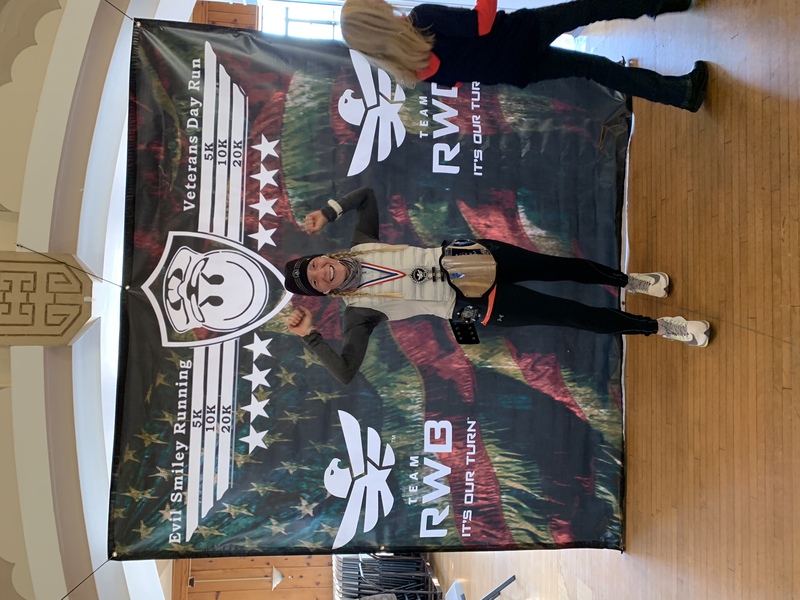 On Saturday, Evil Smiley Running held their annual Veteran’s Day Races in Kenosha, Wis. Just over the Illinois border, this race series is an easy commute from the Chicagoland area with free parking and a beautiful lake front course. 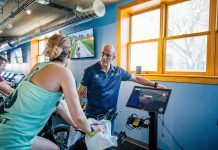 The race offered a 5K, 10K, and 20K distance option with all runners beginning together at 8 a.m. The morning was chilly with a hefty wind coming from Lake Michigan. Runners stayed huddled together in the heated lake front shelter until just minutes before the start. 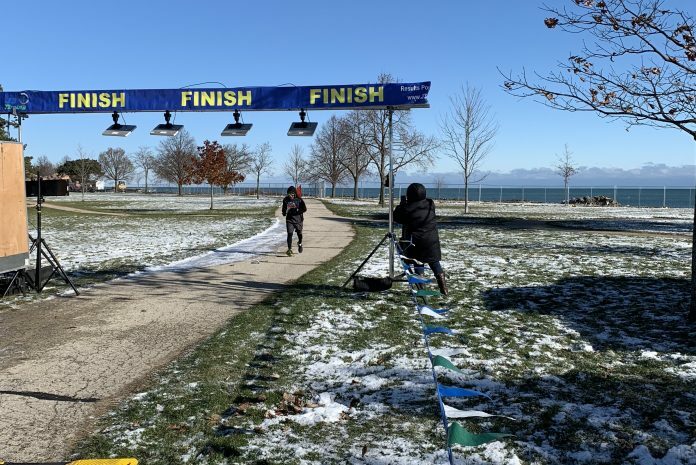 The course began through a residential area and then hugged the lakefront path for the first couple of miles before routing runners up a flight of stairs. Runners headed north and braved a few inclines before entering the Carthage College campus to the turn around. This out-and-back course showcased the many features of Kenosha including a residential tour, lakefront scenery and college campus. The race was well organized with ample pre-race communication. There were only a few aid stations, but with the cold weather, this was not a big deal. The highlight of this race is the winner’s belt that is awarded to the Male and Female overall and Masters’ winners. Runners compete for this highly coveted prize each year and race to the finish line in order to reign for the year. This is definitely the most extravagant winner’s award I have seen at a local race. 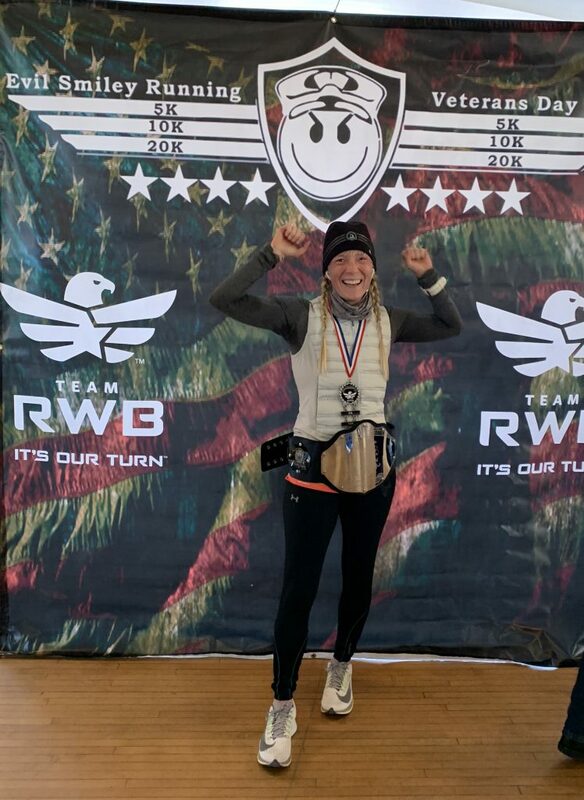 Female Masters winner, Jennifer Abanero, earned the champion title for this year’s 20K.